When Amy Reames started experiencing shortness of breath last summer, she didn’t seek medical attention right away. It would come and go, but when her legs started to swell, it gave the emergency room nurse and her physician’s assistant husband, Aaron, cause for concern. Their decision to go to the emergency room in August 2015 likely saved the 36-year-old’s life. An abnormal EKG showed a heart that was functioning at 50 percent of its capacity. Her condition rapidly deteriorated, leaving Aaron Reames to wonder if he was going to have to tell their children she was gone. 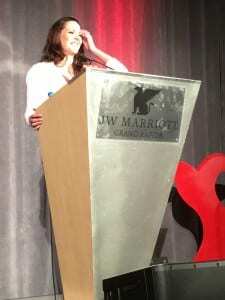 Amy Reames speaking at the Grand Rapids Go Red for Women luncheon. Fortunately, Amy Reames pulled through, although she’s still recovering. Her story brought many to tears at Friday’s American Heart Association Go Red for Women Luncheon in Grand Rapids. Blue Cross Blue Shield of Michigan was a sponsor of the event and Blue Cross Blue Shield of Michigan director of West Michigan Upper Peninsula Administration Kellie Norton chaired this year’s luncheon. “It was unexpected and a shock and truly a tragedy in our lives,” Reames said. Aaron Reames said the couple should have known better. Even though they both have extensive medical knowledge because of their professions, symptoms were at first dismissed as they easily could have been caused by something else. Both want to raise awareness for how symptoms of heart disease can present and they want people to trust themselves and seek medical attention if they feel like something could be wrong. “If you’ve got symptoms, go in,” Aaron Reames said. Heart disease is the leading cause of death for Michiganders. In fact, 39 Michigan women die every day from heart disease and stroke. Dr. Laura Franey, a cardiologist with Spectrum Health, said women in particular tend to be caretakers of their families, but often neglect their own health. Symptoms might not show up as heavy pressure on your chest or other commonly recognized red flags. Women might feel fatigued, nauseated or experience discomfort in their back or arm. Franey delivered the American Heart Association’s “Life’s Simple 7” at the luncheon, a set of key steps for women to take to reduce their risk of heart disease. Get active. Franey said you don’t need to start running marathons to fulfill this – 30 minutes of physical activity most days of the week will do. Break it up into two 15-minute walks if that’s what your schedule will allow. Eat better. Pump up the fruits and vegetables. Decrease the red meat and saturated fats. Lose weight. If you’re out of the healthy range, getting active and eating better can help you take off pounds. Stop smoking. “Don’t quit quitting,” Franey advised those who’ve struggled to give up this bad habit. Control cholesterol. Work with your doctor to determine if your levels are healthy. Manage blood pressure. Your goal should be a reading of 120/80. Anything higher should be discussed with your doctor. Reduce blood sugar. For diabetics, constant monitoring is a must, Franey said. For those without diabetes, a normal fasting blood sugar should be less than 100. Talk with your doctor about what you can do if it’s high. Get more healthy heart advice at the American Heart Association’s website. Is Your Hectic Life Hurting Your Heart?